A good mystery is often where you find it. Photographer Meagan Abell recently made a discovery during a thrift store expedition that not only set the internet abuzz, but also contains an interesting astronomical dimension as well. This is an instance where observational astronomy may play a key role in pinning down a date, and we’d like to put this story before the Universe Today community for further insight and consideration. Meagan first discovered the set of four medium format negatives at a thrift store on Hull Street in Richmond, Virginia. Beyond that, they have no provenance. Meagan was amazed at what see saw when she scanned in the negatives: the images of a woman walking into the surf have an ethereal beauty all their own. Obviously the work of a skilled photographer, the photos appear to date from the late 1940s or 1950s. Meagan turned to social media for help, and cyber-sleuths responded in a big way. #FindTheGirlsOnTheNegatives became a viral hit, but thus far, who the women in the images are and the story behind them remains a mystery. We do know one tantalizing bit of information: several Facebook users have pinned down the location as Dockweiler Beach, California near Los Angeles International Airport. Keen-eyed observers noted the similarity of the outline of the distant hills seen to the north in one of the images. A few things caught our eye upon reading the mystery of the girls in the negatives this past weekend. One shot clearly shows the notch of the Sun just below the twilight horizon. A second, even more intriguing image shows a tiny sliver of Moon just to the subject’s upper left. Could a date, or set of dates, be estimated based on these factors alone? Let’s slip into astro-detective mode now. A few things are obvious right off the bat. First, the Moon is a waxing crescent, meaning the shots would have to be set in the evening. This also lends credence to the ocean being the Pacific, because the sunset is occurring over water. The similarity in cloud formations across all of the images seen also strongly suggests the photographer took all of the pictures on the same evening, during one session. Can that crescent Moon tell us anything? It’s tiny and indistinct, but we have a few things to go on. The Moon looks to be a 5-6 day old waxing crescent about 30-40% illuminated. Not all waxing crescent Moons are created equal, as the ‘horns of the Moon’ can point in various directions based on the angle of the ecliptic to the local horizon at different times of the year. The horns of the Moon appear to be oriented about 35 degrees from horizontal. Assuming the subject in the red dress is elevated slightly and about 20 feet from the observer, the Moon would be about 25-30 degrees above the horizon in the shot. Now, Dockweiler Beach is located at latitude 33 degrees 55’ 20” north, longitude 118 degrees 26’ 3” west. The beach itself faces a perpendicular azimuth of 240 degrees out to sea, or roughly WSW. Already, we can rule out winter and spring, because of the unfavorable angle of the dusk ecliptic. We want a time of year with A) a shallow southward ecliptic and B) a sunset roughly due west. Turns out, late July through early October fit these ideal conditions for the location. The motion of the Moon is a wonderfully complicated affair. The path of the Moon is inclined about five degrees relative to the ecliptic, meaning that the Moon can ride anywhere from declination 28 degrees south, to 28 degrees north. From latitude 34 degrees north, this puts the mid-July ecliptic at about 33 degrees elevation across the meridian at sunset. The nodal points where the path of the Moon crosses the ecliptic also precess slowly around the celestial sphere. This motion completes one revolution every 18.6 years, meaning that the Moon reaches those maximum declination values (sometimes referred to as a ‘long nights’ or the Major Lunar Standstill of the Moon) just under once every 19 years. This occurred last in 2006, and will occur next in 2025. Incidentally, we’re at a shallow mid-point (known as a Minor Lunar Standstill) between the two dates this coming Fall. Of course, this is just a hunch. Perhaps the subject was standing on a westward facing spit of rocks. Or maybe the photographer was closer or farther away than estimated. Or maybe the negative was inverted left to right along the way… that’s why I’d like to invite, you, the astute sky watcher, to weigh in. And even if we pinned down the date, the mystery remains. Who are the girls in the negatives? What became of the photo shoot? And how did the negatives end up in a thrift store in Virginia? Read another astronomical mystery sleuthed out by Dave Dickinson, with The Downing of Spirit ‘03: Did the Moon Play a Role? Update: Meagan responds: “The object along the horizon in the crescent Moon image is actually just a transparency defect.” A second image from the same strip does not show the white speck (arrowed above) near the horizon. ESA astronaut Alexander Gerst from Germany who recently returned from a six month voyage to the International Space Station (ISS) has a special Christmas gift for all – a stunning six-minute timelapse compilation of his favorite images of Earth taken during his “Blue Dot” mission in 2014. “A 4K timelapse showing our planet in motion, from my favourite Earth images taken during the Blue Dot mission,” wrote Gerst in connection with his spectacular timelapse video released to coincide with Christmastime. “I wish all of you a merry Christmas! It was a wild year for me, thanks for joining me on this fascinating journey!” said Gerst in English. “Wünsche euch allen fröhliche Weihnachten! War ein wildes Jahr für mich, vielen Dank, dass ihr mit dabei wart!” said Gerst in German. You can watch the Earth roll by through Gerst’s perspective in this six-minute timelapse video combining over 12,500 images taken during his six-month mission aboard the ISS that shows the best our beautiful planet has to offer. “Marvel at the auroras, sunrises, clouds, stars, oceans, the Milky Way, the International Space Station, lightning, cities at night, spacecraft and the thin band of atmosphere that protects us from space,” according to the video’s description. Gerst would often would set cameras to automatically take pictures at regular intervals while doing his science research or preparing for the docking of other spacecraft at the ISS in order to get the timelapse effect shown in the video. The robotic arm capture and berthing of the SpaceX Dragon cargo ship and the release of the Orbital Sciences Cygnus cargo freighter are particularly magnificent in a rarely seen timelapse glimpse of visiting vehicles that are absolutely essential to keeping the station afloat, stocked, and humming with research activities. Gerst served aboard the ISS between May and November this year as a member of the Expedition 40 and 41 crews. Gerst launched to the ISS on his rookie space flight on May 28, 2014, aboard the Russian Soyuz TMA-13M capsule along with Russian cosmonaut Maxim Suraev and NASA astronaut Reid Wiseman. They joined the three station flyers already aboard – cosmonauts Alexander Skvortsov & Oleg Artemyev, and astronaut Steve Swanson – to restore the station crew complement to six. Gerst and Wiseman became well known and regarded for their prolific and expertly crafted photography skills. They returned to Earth safely on Nov. 10, 2014, with a soft landing on the Kazakh steppes. Alex is Germany’s third astronaut to visit the ISS. He conducted a spacewalk with Wiseman on Oct. 7 while aboard. He is trained as a geophysicist and a volcanologist. Read my story detailing Christmas 2014 festivities with the new crews at the ISS – here. A mistake led to this stunning image of the crescent Moon and the Tower of Pisa this week. The Moon has a bit of Earthshine and a reddish glow from its low elevation in the sky, snuggling up to the Leaning Tower of Pisa. “Truly a beautiful combination and an awesome scenery. Impossible to not take a picture of it!” Giuseppe said. This photograph was taken with a Nikon Coolpix P90 Bridge Camera on tripod, ISO 100, f4.5, 2.5″ exposure. From IBEX data, McComas and his team were able to make refinements in relative speed of our system, as well as finding more information about the local interstellar magnetic field strength. IBEX data have shown that the heliosphere actually moves through the local interstellar cloud at about 52,000 miles per hour, roughly 7,000 miles per hour slower than previously thought. That is slow enough to create more of a bow “wave” than a shock. Another influence is the magnetic pressure in the interstellar medium. IBEX data, as well as earlier Voyager observations, show that the magnetic field is stronger in the interstellar medium requiring even faster speeds to produce a bow shock. Combined, both factors now point to the conclusion that a bow shock is highly unlikely. This new finding perhaps correlates with earlier investigations by the CLUSTER mission, which found the bow shock was remarkably thin. The IBEX team combined its data with analytical calculations and modeling and simulations to determine the conditions necessary for creating a bow shock. Two independent global models — one from a group in Huntsville, Ala., and another from Moscow — correlated with the analytical findings. Their paper was published today in the journal Science. 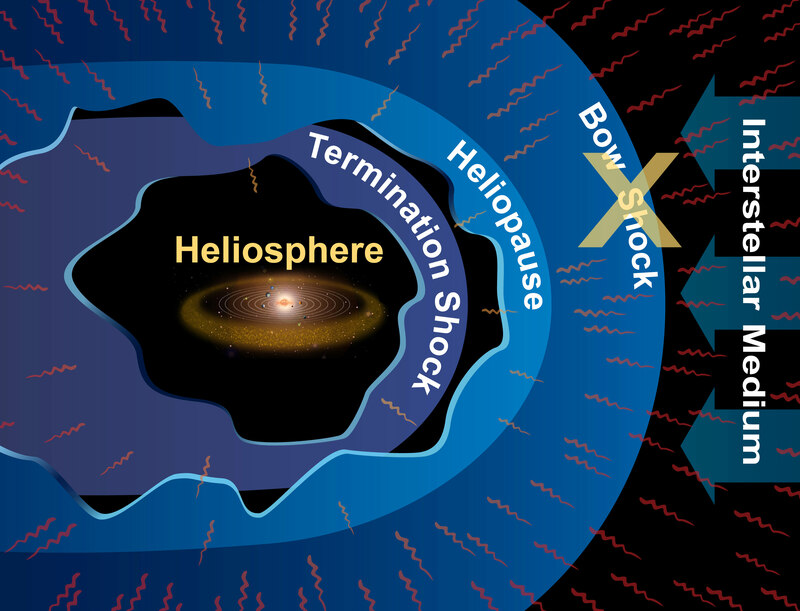 How does this new finding change our understanding of our heliosphere? Astronaut Don Pettit posted this beautiful image on his Google+ page showing a view from the space station reminiscent of science-fiction. Of course, that’s the constellation Orion off in the distance, but there’s a bit of a debate going on at Pettit’s post whether the diffusion of light seen emanating from the ISS is just light from inside the space station windows (it appears to be the Cupola) spreading out into total darkness, or if the effect is actually from a reboost of the ISS for a Debris Avoidance Maneuver that was performed around the time this image was taken. The original can be found here on the NASA Gateway to Astronaut Photography website, and here’s another image in the sequence. OK, all you imaging experts out there: until Pettit gives us the real scoop, what are your thoughts? Thanks to Elyse David for the heads up! Apologies for the lack of posts the past few days, but here’s a round-up across the Universe (and the world wide web) of some of the latest and best space news. Above, watch a video about the site being chosen for the E-ELT. Todd Halvorson of Florida interviews Elon Musk of SpaceX about the upcoming launch of the Dragon spacecraft, schedule for May 11. The Wall Street Journal reports that Charlie Bolden is taking flack for proposing a generous retirement plan for astronauts. The SciGuy, Eric Berger of the Houston Chronicle interviews Jeffrey Manber, CEO of MirCorp who says NASA must go commercial or it will perish. In the easternmost part of Switzerland near the Italian border, lies a pristine area of land ranging from 1,400 to 3,173 meters above sea level. It encompasses 172,400 hectares of forests, alpine grasslands and bare rocks or screes that are strictly protected and not inhabited. Each year, around 50 researchers from Switzerland and abroad carry out scientific studies in the area. A research committee is responsible for the coordination of the various projects, such as hydrology, meteorology, biodiversity, ecology. Now, another specialty is arriving in this area in form of a private endeavor – astronomy. AAV Lue-Stailas is a new center for amateur astrophotography in the eastern Alps of Switzerland. Built on a sunny terrace at 1935 m (6300 ft) and facing south into the beautiful valley of Muestair, the center’s prime geographical location benefits from excellent sky conditions with about 250 clear nights a year. Thanks to its rigorous protection policy, Val Muestair was able to keep much of its original rural and natural habitat. This will soon be honored by the regions participation in a new high-alpine UNESCO Biosphere Reserve in the European Alps, the Val Muestair/Swiss National Park Reserve. AAV Lue-Stailas will collaborate with this unique â€œBiosferaâ€-Project in order to bring its pristine skies to the public. The center will open in March of 2009, the International Year of Astronomy. –caption: Filamentous clusters of galaxies as pictured by the HST (left) or in a computer simulation (right). Neuronal cell culture as seen in a fluorescent microscope. And so will meeting the lovely, giving Vaclav and Jitka Ourednik. Here’s an article about another project like this: remember Biosphere 2? Don’t just look inward, look outward. There’s a whole astrosphere out there. Your picture for the day is Saturn (of course), captured by Stargazer 7000. Astronomy Picture of the Day has a beautiful shot of the night sky over Sweden. PZ Myers has spoken and I must obey. Here’s all you need to know about expelled. And here’s a review for another movie, Dark Matter. Speaking of dark matter, Ethan Siegel explains the practical uses for his research. Astroprof recalls famed astronomer John Archibald Wheeler; the man who coined the term “black hole” passed away this week. Bad Astronomer Phil Plait celebrated Yuri’s night, in style. It might not look like it, but this photograph is mind-bendingly cool. The bright streak is the path of the International Space Station, and the dimmer one is the US military satellite that’s going to crash back to Earth – both seen passing through the heart of Orion. Good job Autoclub! Centauri Dreams talks about using the Sun’s gravity as a natural telescope lens. Problem is, you have to get out to 550 AU to make it work. The Space Review has a great article about people preparing for space tourism. So far, 93% have passed the physical tests. In the future, solar power will rule! APOD has a great picture of a recent spacewalk outside Columbus. NY Times is reporting that NASA thinks it can fix a serious flaw in its Ares rocket design. Astropixie wants to be Stephen Colbert’s astrophysicist. And finally, one of the best posts of read in a long time. Phil perfectly explains why science isn’t faith.